It's no secret that Glenn Beck cares about racism- he cares about it so much that he spent the last year and a half obsessing about it. Among his greatest hits are: calling Obama a racist with "a deep-seated hatred of white people,” claiming that our black president wants reparations, lecturing that race relations were “right on track” before the Civil War, and fixating on Robert Byrd’s stint in the KKK as a youth when commemorating the late senator. 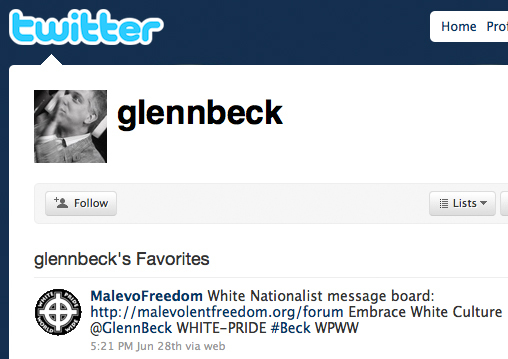 In fact, Beck cares so much about racism that he was recently caught with a tweet from the white nationalist organization Malevolent Freedom on his favourites list Wednesday (08/04/10). Screencap after the jump. I’m sure there’s more on their forum, but registration is mandatory, and I did not want to sign up.